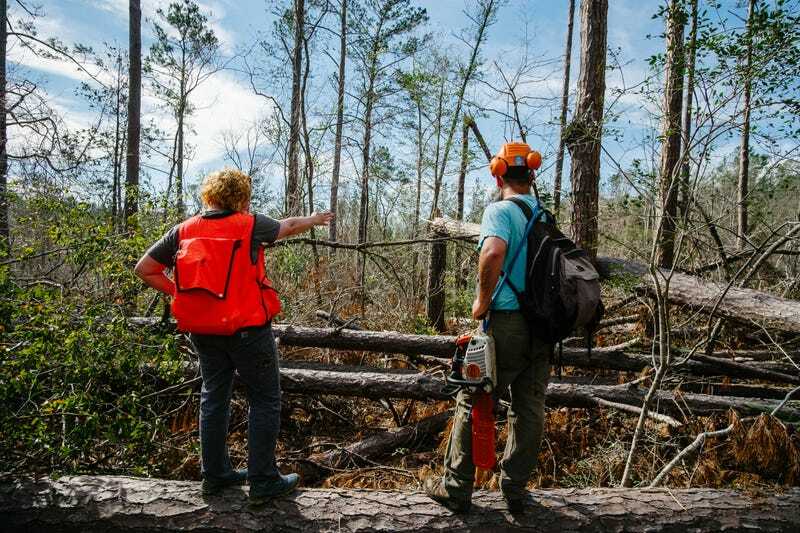 Emily Coffey charts a course with Patrick Thompson through the North Florida woods in search of torreya. Florida is not a place known for its verticality. Its highest point—the generously named Britton Hill on the Florida-Alabama border—sits only 345 feet above sea level, making it the lowest high point for any state. But what Florida lacks in height, it makes up for in topographical variety. And its most varied landscape is in the Panhandle. Emily Coffey and Patrick Thompson navigating downed trees piled 8-10 feet high over a creek at the bottom of a steephead ravine. Walk along the uplands of loblolly pine and reindeer moss for long enough, and suddenly the landscape will fall away, opening into sharp ravines like surprise butterfly wings. Years of erosion formed these steep gullies, which can drop down to 100 feet deep. Grand canyons they are not, but the ravines provide refuge for an ecological community that more closely resembles those found in the Appalachians hundreds of miles to the north than nearby Floridian ecosystems, owing to the fact that their canopies keep things relatively cool and moist. That also means they rarely see fire like the upland pine forests, essentially trapping species in the ravines (or in a safe house, as the case may be). On an unseasonably warm day for early February, I stood at the top of one of these ravines on land protected by Torreya State Park with Emily Coffey, vice president of conservation and research at the Atlanta Botanical Garden, and Patrick Thompson, a specialist from Auburn’s arboretum who is a certified chainsaw expert, about to begin a grueling day of hiking, mapping, data collecting, and for Thompson, some serious chainsawing. With most of the tree cover decimated by Hurricane Michael four months ago and the few still standing hardwoods having shed their leaves, we had precious little shade on our hike as we dropped into the ravine. There are no hiking trails to where we were going, and even if there were, they would have been obliterated by the chaos the Michael sowed. It was like looking into a funhouse mirror. The forms of trees were broadly recognizable, but they’d been turned at odd angles, the product of Michael’s winds that continued to roar at Category 4 levels dozens of miles inland, a time when most storms begin to peter out. Branches pointed up or down rather than out, trunks blocked our progress, piles of trees that weigh multiple tons each were stacked on top of each other like precarious lean-tos put together by giants. We had to take care traversing these obstacles, not wanting to fall off or slip between logs and snap a leg. The area is also a rattlesnake hotbed, something my ophiophobic self was happy to learn after we were back at the truck. Coffey warned that while most widowmakers—shards of lumber clinging to what’s left of the canopy—had fallen, we should still keep an eye out as we contorted our bodies to navigate the broken landscape. By the end of our day in the woods, my legs were covered in deep gashes and my body was bruised. Waking up the next day in my Tallahassee hotel, I felt like I was a tackling dummy for Florida State’s football team. In addition to having to watch for death from above and below, Coffey and Thompson also had a task at hand. Coffey pulled out her phone and used GPS to guide us on a looping path through the ravine system. Our goal for the day was to check on torreyas her group with the Atlanta Botanical Garden and local volunteers spent months even prior to Michael painstakingly mapping out in an app called Avenza Maps. The plan was to see what trees survived the storm and which need to be liberated from under toppled trees using the chainsaw Thompson had slung over his shoulder on a thick blue rope and carabiner. Thompson measuring the height of a torreya. Coffey cataloging the location and condition of the torreya we visited. Coffey passing Thompson a ruler to measure the depth of leaf litter around a torreya sitting under pile of logs downed by Hurricane Michael. The downed wood was suspended high enough to allow the tree to grow and provide shade, making this a particularly lucky torreya. Coffey spray painting a shard of timber above a torreya. The neon pink will make it easier for researchers to see the site and revisit it on future surveys. Coffey holding a torreya clipping that will be brought back the Atlanta Botanical Garden. Thompson using duct tape to wrap up a snapped torreya trunk, proving duct tape really can be used to fix anything. The torreya’s range likely extended to North Carolina before the last Ice Age. But the ice sheets that crawled down from Canada into U.S. ground the northern denizens to dust and confined torreya to the steephead ravines in Florida. Once the ice receded, those trees had no way to find their way back north. Today, only three counties in Florida and one in Georgia are home to torreyas. They’re among the special plants that grow here; the last vestiges of the taxifolia line. Other types of torreya live in California, Japan, China, and Korea, and the lineage can be traced back 165 million years. Decades ago, the ravines that Coffey, Thompson, and I walked through were part of ground zero for torreya. You couldn’t throw a rock down a slope without hitting one. The trees didn’t have a ton of commercial value and were mostly used to fire the boilers of 19th and 20th century steamboats passing through the Apalachicola River or make sturdy fence posts. But being an endemic species only found in this tiny corner of the world and an important part of cultural lore imbued the tree with value beyond mere dollars and cents. Then, in the early 1900s, the trees began mysteriously dying off. Researchers eventually pinned the cause of the torreyas’ declining health on an invasive fungus. By 1914, Coffey said the torreya population stood at 375,000 or roughly five trees per hectare. The current population sits at just roughly 750 plants or 0.2 trees per hectare. And the remaining trees are, to put it lightly, sad sacks. Before the fungus arrived, torreya could reach up to 50 feet in height, their prickly needles jostling for space among the hardwoods that make up most of ravine’s canopy cover. The “healthiest” tree I saw in two days tromping through the woods was maybe 10 feet tall, its spindly trunk slowly bending over. Many are infected with the fungus, its telltale blisters girdling their trunks. A torreya infected with fusarium fungus. The sore visible on the trunk is indicative of the disease wiping out the trees. The botanical garden Coffey works at is helping coordinate efforts with Fish and Wildlife Service. The agency put out a five-year conservation plan last August, something it has to do since the tree has been listed as endangered since 1983. As part of that, my not-so-leisurely stroll in the woods with Coffey and Thompson was about more than taking stock of the trees and chainsaw liberations. Coffey took clippings of the trees to bring back to Atlanta. With the odds of torreya’s survival in the wild looking increasingly slim, the collection and work taking place in the garden’s labs and greenhouses could be the only way to ensure its continued existence. In many ways, the torreya’s plight is all too common. Forests everywhere have been hit hard by various combinations of diseases and pests as humans have ushered invaders around the world. Climate change has added further stress on ecosystems already being pushed to the brink. And the road of the sixth mass extinction is already littered with species that have been wiped out. The American chestnut (invasive fungus), the black, green, and white ash (invasive beetle), whitebark pine (local beetle aided by rising temperature), and Joshua tree (climate change) are just a handful of the trees under assault in the U.S. alone. But the torreya still stands out as an extreme case given the precious few survivors left and the sudden shock that Michael dealt to the ecosystem they’re a part of. The tree also has its own unique path to salvation, one that could inform how ecologists go about saving other imperiled species. Hundreds of miles from the upside down woods of North Florida, the scene is much more familiar at the Atlanta Botanical Garden. There, Coffey handed me off to Trey Fletcher, a conservation horticulturist, to show me the torreya collection that acts as safeguard should all the trees in the wild disappear. We stood outside the garden’s greenhouse for rare plants. Ironically, a stuffed raven and a sign reading “Hades Lane” are perched over the entrance, but beyond the doors sits the torreya’s best chance at survival. Fletcher led me into the swirling mists that spilled from the greenhouse’s open door. We hung a sharp left and there, growing under an array of red, white, and blue lamps that provide a full spectrum of light, sat neat rows of torreya clippings from Coffey’s trips to the North Florida woods neatly ensconced in soil topped with white pebbles. The clippings serve multiple purposes. Once they grow a bit taller, they’ll be brought to garden’s Gainesville facility located 45 minutes away. Emily Coffey in the uplands of North Florida after a day of bushwhacking in the steephead ravines. Patrick Thompson after a long day of bushwhacking and chainsawing. Leigh Brooks stands outside her home, which sits just down the road from Torreya State Park. Trey Fletcher amidst the torreya at the Atlanta Botanical Garden’s Gainesville research site. Fletcher also showed me that operation, tucked in the middle of a tony suburban enclave. Walk up a dirt road much less strenuous than the Florida woods and through two gates and you’ll find a clearing where dozens of mature trees clamber for space in an open air lab of sorts. Wooden posts create a canopy overhead to protect them from the sun like the pre-Michael canopy did in the steephead ravines. The trees here at the Gainesville facility looked healthier, able to support their weight without falling over. Each had a dog tag with an ID number and when the clipping it sprouted from was gathered. These trees are clones and the oldest ones date to the late 1980s. Elsewhere, seeds were stored in a cryogenic state because they’re not capable of staying viable if they dry out. This ex situ collection of trees form a cornerstone of the recovery plan. Scientists here and with the University of Florida are monitoring them to see which have proven resistant to the fungus and have also been using the clippings to help sequence their genomes. Coffey said the analysis will help “see how distinct each individual tree is.” If scientists can find out what makes the trees that can handle the fungus tick, they could crossbreed them. There has even been talk of using CRISPR, a revolutionary new genetic engineering tool, that could open up a fast track to editing torreya genes. It’s all a race against the clock as trees wither away in the wild. And the fallout from Hurricane Michael could open up the ravines to even more punishment than the immediate canopy loss. The lack of tree cover means the ravines could become hotter and drier, and with downed wood everywhere, the risk of previously unheard of fires is on the rise. Just over a week ago, a blaze ignited near Panama City that firefighters couldn’t contain until it burned 600 acres. A similar fire in the steephead ravines could deal a major blow to the torreya still clinging to life there. “If a fire gets in there with all that fuel, it could bake the soil, kill the seed bank and basically turned the entire area into a sterilized ashen wasteland,” Fletcher, who is a sixth generation Floridian who grew up hiking the ravines, told Earther. In that scenario, while somewhat unlikely, the trees in Atlanta Botanical Garden’s care and a few scattered in other ravines on private land that was relatively unscathed by Michael could be all that remain. A visiting horticulture society group looks into the greenhouse where torreya clippings live alongside other rare plants. Torreya growing at the Atlanta Botanical Garden’s Gainesville research site. While scientists search for a cure, a group of locals back in Florida is administering palliative care to the trees in the forest. Leigh Brooks, a local who helped found Torreya Keepers, told Earther the group is working on putting together information for private landowners on how they can care for torreya on their property. Those trees are not protected by the Endangered Species Act and in rural and largely conservative North Florida, having locals spread the message on how to conserve them is likely to go a lot further than outsiders or the federal government stepping in. Coffey called this work with private landowners “a big deal” to keep the whole effort to save the tree moving forward . Torreya Keepers is also looking into whether it can do lidar-based mapping—something Brooks has dabbled in—to better track the remaining trees. “If our group can do this one piece and the other partners can do their pieces, we can ultimately give the species a better long term chance for survival,” Brooks said. Another group, Torreya Guardians, is doing what Coffey called “rogue” work. The group doesn’t follow the conservation practices set by organizations like the International Union for the Conservation of Nature, and instead transplants torreyas all over the country. That may preserve the tree, but it could also unwittingly introduce pathogens into new forests, spurring another dieoff of a different species. But the fact that they exist speaks to the oddly passionate fanbase of a scraggly, good-for-nothing tree. And it raises deeper questions about the efforts to save the tree in the first place. There are dozens, if not hundreds, of people devoting not insubstantial portions of their lives to the torreya. Sure, it plays a role in the ecosystem and local lore, but there are decidedly bigger issues afoot. Amphibians are undergoing a global die off. Corals are boiling to death. People are dying due to climate change. But then, the torreya is still a thread in that unraveling fabric, one that Coffey and the others are working to keep from being stripped away. And their small corner of the broader effort to stave off the sixth mass extinction could yield dividends elsewhere by unlocking new research and conservation avenues to help preserve other species. Frankly, the natural world is going to need all the help it can get.